Spectral space-spies and mushroom people have arrived today in Endless Space 2 and Endless Legend. The two expansions – Penumbra and Symbiosis, respectively – each add a new playable faction to the already-massive 4X strategy games, plus a major game-changing new feature that can impact everyone. Below, a developer stream taking an hours-long dive into both expansions. Those new to the Endless universe (a sprawling sci-fi setting shared by all of Amplitude’s games, including Endless Space 1 & 2, Dungeon Of The Endless and Endless Legend), all the games in the series are free to try on Steam for the weekend, along with discounts to keep. Endless Space 1 is forever if you sign up and link your Steam account over on their Games2Gether site here. Have You Played Endless Space? I was really good at Endless Space. Me and my internet buds (found through the RPS community, in fact) used to while away our weekends in Amplitude’s first stab at 4X strategy, embroiled in bickering over juicy planets and strategically-important hyperspace lanes. My empire would nearly always shine the brightest and the best – at least until the other galactic players would team up to take me down. Nobody knew quite why I did so well, other than it might have something to do with me taking twice as long to end my turn. Amplitude Studios has grown significantly since the Parisian developer, as a small team that you could count on one hand, first conceived Endless Space. Now they work out of two floors in a high-rise near the centre of the metropolis and are busy working on their fourth game, Endless Space 2. Recently, they announced a partnership with publisher Sega. It s an evolution and escalation that s echoed in their games. 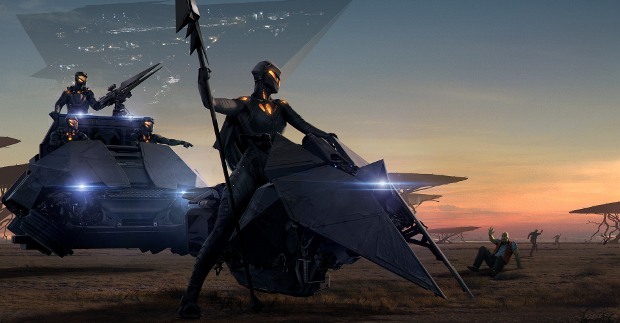 Endless Space 2, then, is an opportunity to show everyone just how much they ve grown, combining the ideas that birthed their first game with the lessons they ve learned through the much lauded Endless Legend. I spoke to the company’s two founders to discuss why they’re making the game now, what the partnership with Sega means for the studio, and more. Endless Space 2 is the sequel to French studio Amplitude s cosmic 4X game, though it feels just as much a follow-up to their exceptional fantasy strategy affair, Endless Legend. Comfortably sitting next to all the numbers, resources and planetary management are lively stories, epic quests, and fascinating space-faring species, each with distinct hooks the ingredients that made the company s last game something special. I traveled to Amplitude s offices to get my hands on the game, and thus far my goal is to try and get rich the noblest of pursuits. Sega have acquired Amplitude, creators of the Endless series of strategy games. Endless Legend was our game of the year in 2014 and its predecessor Endless Space is set to receive a direct sequel that will enter Early Access later this year. Sega will now publish that game, as well as assuming responsibility for the back catalogue of Endless games, which includes Dungeon of the Endless, a fantastic tower-defense/roguelike hybrid. Amplitude are one of the smartest young strategy studios around and they join Creative Assembly, Relic and Sports Interactive (Football Manager is> a strategy game) in Sega’s stable of PC developers. That’s a mighty strong line-up for a company that old men like me still associate with ancient consoles and platform games rather than PC publishing. Perhaps Amplitude’s award-winning strategy game really is> endless. A large free update for Endless Legend [official site] is due to land sometime today and there will be two cash-money chunks of DLC arriving alongside. The free stuff comes under the heading Forges of Creation and brings AI improvements, new modding tools, including compatibility with free map editor Tiled and the ability to reskin 3D units. There will also be Steam Workshop integration. The two purchasable packs contain new music, items and minor faction quests. More details below. Endless Space was a fine 4X strategy game with interesting, distinct races and a best-in-class interface. Then Amplitude Studios’ follow-up was Endless Legend, a fantasy 4X game set within the same universe which was best-in-class in general. In fact, we named it the best game of 2014. So pardon my excitement for the news that Amplitude are now making Endless Space 2 [official site] and have released the first CG trailer. One of the year’s Bestest Best Games is currently discounted by 50% on Steam. The game is Endless Legend, Amplitude’s superb 4X fantasy game, and it’s currently 13.49, but only until 6pm GMT. The discounts extend to all three of the studio’s releases, so you can also grab debut title Endless Space and this year’s brilliantly inventive roguelike door defense thing> Dungeon of the Endless for 4.99 each. There’s also a bundle with all three plus DLC for 30.49. If you need to know more, our reviews of Dungeon and Legend are here to help, and Jim and I wrote about Endless Legend as part of our December festivities. Adam reported on Endless Legend‘s free add-on Visions of the Unseen last week, but now it’s out, we know the details of what it contains, and it comes alongside a smaller but similarly free add-on for Amplitudes previous 4X strategy game, Endless Space. Visions of the Unseen? More like posts> of the seen>, right? Amplitude are having a very good year. The studio’s debut release, Endless Space, was a good 4X game but the follow-up, Endless Legend, is a great 4X game. I’m fairly sure there hasn’t been a better release in the genre this year. Along with that, there’s Dungeon of the Endless, a smart cocktail that contains a dash of roguelike, a splash of tower defence and several fingers of cunning twists. Endless Legend, as you might expect given the name, isn’t quite done yet. A second free add-on has just been announced. It’s called Visions of the Unseen and the first details are below.